The BBC were on the phone early this morning seeking my views on Boris Johnson’s ‘greed is good speech’. Here is a press release on what I had to say on the matter . . . .
Multi-millionaire businessman Kevin Green today gave a cautious welcome to London Mayor Boris Johnson’s ‘greed is good speech’. “As with all things from the mouth of Boris, his speech was a bit of a curate’s egg – good in parts,” Green said. Boris Johnson used the annual Margaret Thatcher lecture to declare that inequality is essential to fostering ‘the spirit of envy’ and hailed greed as a ‘valuable spur to economic activity’. The London mayor called for the ‘Gordon Gekkos of London’ to display their greed to promote economic growth. Burry Port based Green, 50, runs a massive private property portfolio and other enterprises in a number of business sectors. He said: “Boris is always entertaining and provocative. “Greed is a vice and no-one with a moral compass should be advocating that. “But there is nothing wrong in having a passion and a highly-tuned enthusiasm for making money. “Money makes the world go round and anyone who makes lots of money can use that money carefully to sow the seeds for other businesses and people to develop and generate more wealth in the economy. “I work as a wealth coach helping inspire other people to become millionaires. There is nothing wrong in being ambitious and wanting more wealth for yourself. But you also have to be tuned in to the real world and appreciate there are people out there less fortunate than yourself. “I work closely with selected charities such as the Make A Wish foundation. Generating money is fine as long as it is linked to your passion in life. Helping others is also important. “I was once homeless and I know what it is like to be looking for the next crust. I am a self-made millionaire and am proud of what I have achieved. But I also recognise and appreciate that there are people less fortunate than myself. “Being enthusiastic and passionate about your work is fine. Being greedy is something else. My views on the current RBS debate . . . The current publicity about RBS bank has struck a nerve. Multi-millionaire businessman Kevin Green today joined the growing clamour for action against banks who put the squeeze on small businesses. “I am appalled and disgusted by the actions of RBS,” said Green, who runs a massive private property portfolio and other enterprises in a number of business sectors. “Conversations with other businesses throughout Wales suggest that RBS isn’t the only culprit here. “But they are, of course, the ones currently in the spotlight and receiving all the media attention. “The treatment of SMEs (small and medium-sized enterprises) by RBS is nothing short of scandalous. “Stories of the bank exploiting the small print in loan deals abound today. For example, one business I know missed a loan repayment one month and quickly found themselves heading down the road of default. “The pressure put on customers by RBS is neither fair nor morally acceptable. The old joke about banks pulling away the umbrella the minute it starts to rain appears to be very true in today’s world. “The RBS tactic seems to have been to put swift and heavy pressure on some SMEs to get them liquidated. Then, hey presto, the bank comes along and captures and uses the assets for its own purposes. Mr Green added: “Earlier this year, I was the in vanguard of leading complaints against the Bank of Ireland for the underhand tactics the bank used in raising mortgage tracker rates. “Obviously, I welcome any investigation of RBS. But I would also urge the Government to do more to shine a light on the custom and practice of some of our banks. It's time to get on board for the Big Ideas Wales Challenge. I'm helping to back the Welsh Government project to identify and support Wales’ young entrepreneurs of the future. The November 27 deadline is fast approaching. There are 50 places up for grabs. If you know of a budding entrepreneur, then get them to apply - fast! One of the largest campaigns undertaken to identify and develop Wales’ young entrepreneurs of the future has been launched by the Welsh Government, backed by “Secret Millionaire”, Kevin Green and SuperStars entrepreneur, James Taylor. Hundreds of young people throughout Wales are being invited to apply for 50 places on the Big Ideas Wales Challenge, launched by Deputy Minister for Skills and Technology, Ken Skates AM. The Challenge will scour Wales, interviewing hundreds of young people aged between 16 and 24 years of age, seeking their “big ideas” and helping to develop and cultivate 50 of these into commercial opportunities. Entrepreneur James Taylor will act as an ambassador for the Challenge. He began his business, Superstars, with a bursary under the Welsh Government Youth Entrepreneurship Strategy (YES) in 2005 and has grown the business that now employs more than 180 people. “As part of Welsh Government’s Youth Entrepreneurship Strategy (YES) this flagship challenge has been steered by entrepreneurs to support future entrepreneurs. I am pleased that James Taylor of Superstars will be the ambassador for this Challenge,” said Mr Skates. The business community - entrepreneurs, role models and others partners - will be invited to make individual pledges practical support to help these young people on their journey. This will complement business start up support already in place by Welsh Government and partners. The Challenge begins with the auditions throughout November at venues throughout Wales, backed by pledges from businesses, individuals and organisations to support the 50 young people, followed by the boot camp in January. Details and application can be found at www.bigideaswales.com. The deadline is November 27. Businesses can pledge help that reflects the nature of the business, such as branding and PR packages, trade stands, office space, accounting packages, capital investment and essential equipment. Visit www.bigideaswales.com to pledge. Also backing the challenge is self-made multi-millionaire and social entrepreneur Kevin Green, who featured on Channel 4’s “Secret Millionaire” programme. “Young people have drive and ambition, as well as great ideas. The Big Ideas Wales Challenge is a way of developing and focusing those ideas into a reality and I’m pleased to be backing it,” he said. The Challenge was launched at Cardiff Arms Park, home of the Cardiff Blues and Wales winger, Leigh Halfpenny, who has been named as the Most Inspirational Person in Wales in a survey* of 1,000 young people undertaken by Big Ideas Wales. “It’s great to be seen as an inspirational person for young people. And when you consider it, business and sport is very closely linked. “Not just in the commercial and management sense, but as an individual you have to strive and work towards the goals you want while working with a team to develop those opportunities and rewards. That’s mirrored in the business world where grit and determination can help you reach your goal. Big Ideas Wales is a Welsh Government campaign designed to encourage young people to be more entrepreneurial and help those interested in starting a business take their ideas forward. The campaign itself is managed by Menter a Busnes as the service provider for the Youth Entrepreneurship Services 16-24. This service is part funded by the European Regional Development Fund. Photo: Messrs Taylor, Skates and Green at the launch at Cardiff Arms Park. Those who know my story will appreciate the importance of the Nuffield scholarship in my life. Here's a press release which relates to the Nuffield conference now taking place at The Vale Resort near Cardiff. Millionaire social entrepreneur and wealth coach Kevin Green has gone back to his roots to help repay a personal debt of gratitude to the Nuffield Trust. Mr Green, 50, has been working with the latest group of Nuffield scholars at their UK conference at The Vale Resort near Cardiff. “There were many factors that put me on the road to being a millionaire,” said Mr Green. Mr Green won a Nuffield Scholarship in 1999. He used the bursary to travel and study the attitudes and personalities of high achievers. Along the way, he interviewed Bill Gates and Sir Richard Branson. During the Nuffield study, he learned the simple principles for success and determined the common elements that contributed towards that success. He bought his first property soon after, using credit cards to ‘bridge finance’ the deposit of a buy-to-let mortgage. After quickly renovating it and selling it at a profit, he bought a second. The rest is history. He is now the UK’s largest private sector landlord. Mr Green has been spending time at The Vale with current Nuffield scholars, discussing the reports they present at the end of their scholarship. Mike Vacher, Director of the Nuffield Trust, said he was delighted to welcome the millionaire to the conference. There are more than 400 booked for the two day conference. The 2013 scholars will be giving presentations of their scholarship studies over next two days (Thursday and Friday). Delegates and scholars have travelled from far afield. Many have not been to Wales before. Extra activities during the conference include a trip to the Wales v Tonga game at The Millennium Stadium. Established as travelling awards for farmers in 1947 by the Nuffield Foundation, the Nuffield Farming Scholarships Trust is now an independent, industry-funded charitable organisation. Approximately 20 awards are made each year to people for their self development and the wider benefit to their industry. Scholarships are awarded to applicants who work within farming, food, horticulture, rural and associated industries or are in a position to influence those industries. Applicants are aged between 22 and 45 years (the upper age limit is 45). The Trust seeks people with very special qualities. There is no requirement for academic qualifications, but applicants will already be well established in their career and demonstrate a passion for the industry they work in and be three years post tertiary education. The rewards of a Nuffield Scholarship are tremendous, not only for the individual but for their industry. Scholarships are not awarded to anyone in full-time education or to further research projects. With thanks to Jake Freestone ‏@No1FarmerJak on Twitter for the picture above of me talking to Nuffield scholars. Welsh Government Housing Minister Carl Sargeant was making the headlines earlier this week with the launch of the new Housing Bill for Wales. The UK’s biggest private sector landlord, Burry Port-based Kevin Green, has welcomed the Welsh Government’s proposed new legislation covering housing in Wales. The Welsh Government has just published its first Housing Bill since it gained full law-making powers in 2011. At the heart of the Bill is the twin aim of tackling the alleged “questionable practices” of some landlords and the blight of empty homes. Mr Green, 50, said the broad thrust of the Bill would be welcomed by the vast majority of landlords who operated with a social conscience. “It’s the old adage which says that if you are doing your job properly in the first place, you have nothing to fear,” he said. Mr Green has properties throughout the UK. Most are in South Wales, but he also has properties as far afield as Scotland and Northern Ireland. “I know many other major landlords and they work every hard to make sure the accommodation they provide is up to the correct standard. They also apply fair and reasonable rents and you would never accuse them of exploiting their tenants. “Regrettably, however, there are always a few bad apples. “I have not been able to study the fine detail of the Bill, but my guess is that it will want to tackle unscrupulous landlords and family homelessness. Homelessness is an issue close to Mr Green’s heart. Welsh Government Housing Minister Carl Sargeant said a decent, affordable home was a vital part of everyone’s life. It also described the private rented sector as having “extremes” of good and bad practice. Although there are good landlords, it said some tenants were put in difficult situations by unscrupulous operators, with many enduring “poor conditions, insecurity and, sometimes, threats of eviction”. “The latter, combined with the lack of other options, means that many people, often vulnerable people, put up with the questionable practices of some landlords and lettings and management agents,” the White Paper said. Other measures in the White Paper include a pledge to tackle the blight of empty properties by giving local authorities the power to increase council tax on properties empty for longer than a year. The Bill is expected to set a goal of ending family homelessness in Wales by the end of the decade. Landlord and social entrepreneur Mr Green said most landlords would have nothing to fear from a mandatory register. “Most of us are on ‘the books’ of local authorities and work closely with councils and housing agencies to make sure we apply proper standards, so most respected and caring landlords will have nothing to fear. “I make sure in my business that we work very closely with homeless charities such as Shelter, Women’s Aid and The Wallich. “We do care passionately about the welfare of our tenants. “We have a very widely publicised issue with the Government’s current changes to the benefit system and Universal Credit. But that is a separate issue to this Housing Bill. It's been a wonderful evening at Claridges in London in the company of HRH The Princess Royal, Prince Anne. The occasion was the Carers Trust first anniversary dinner and I was invited by my good friend Hilary Devey CBE, of Dragon's Den fame on the BBC. Hilary is a fellow 'Secret 'Millionaire' . It was a very swish event, featuring a performance by the celebrated Michael Ball. Sadly, Hilary was not well enough to attend. It was lovely to meet and chat to The Princess Royal. Those of you who know me well will appreciate that I love my donkeys. 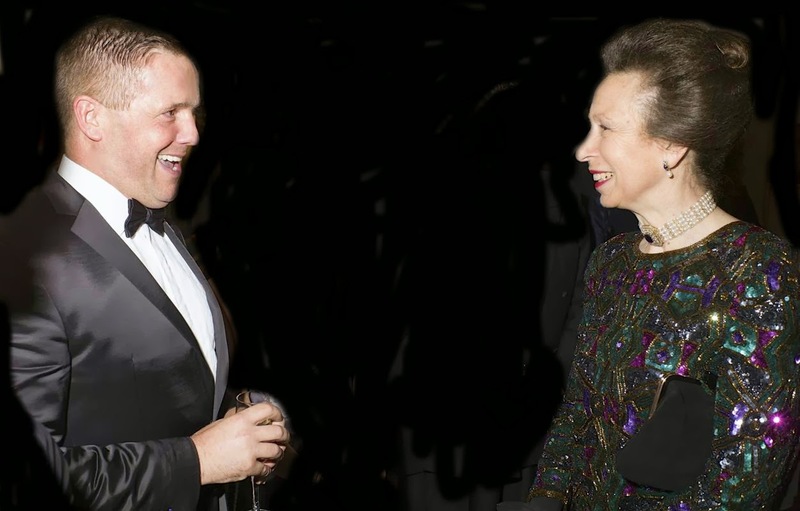 With The Princess Royal's equestrian background, that was an obvious topic of conversation! I was happy to put my hand in my pocket to support the Carers Trust, knowing how dear it is to Hilary's heart. I chipped in £500 in sponsorship for a Kilimanjaro climb and bought two holidays in the auction - one for £4500 to Barbados and another to Tobago for £3200. The auctioneer was the novelist and former politician Jeffrey Archer. It's fair to say he was a very smooth operator and he worked the room brilliantly to raise as much cash as possible on the night for the Carers Trust. Trying to keep a running total was difficult, but I think the evening raised more than £150,000 for the charity. The lovely people at the Carers Trust sent me a splendid thank-you note with some smoked salmon and chocolates as an appreciation for my contribution to the night.